The Key Question Today Is "Who Will Be Forced To Trade?" One day after a near record point drop in the Dow Jones, one which soaked up margin purchasing power for both retail and professional investors and put many traders in deficiency on their maintenance margins, the key question for today - according to Morgan Stanley - is who will be forced to trade? As MS' derivatives strategist Chris Metli writes in his latest note (he has been quite busy today), it’s useful to compare this episode to February. Here, on one hand forced systematic selling should be less now than then and importantly is better understood by traders (likely <$50bn in total supply, see #3 and #4 below for details). On the other hand, the pain for the equity discretionary and quant communities is worse this time and they are sellers not buyers, and that is important because it impacts a broader community of investors. Said otherwise, if this unwind continues it is because discretionary funds continue to de-risk. 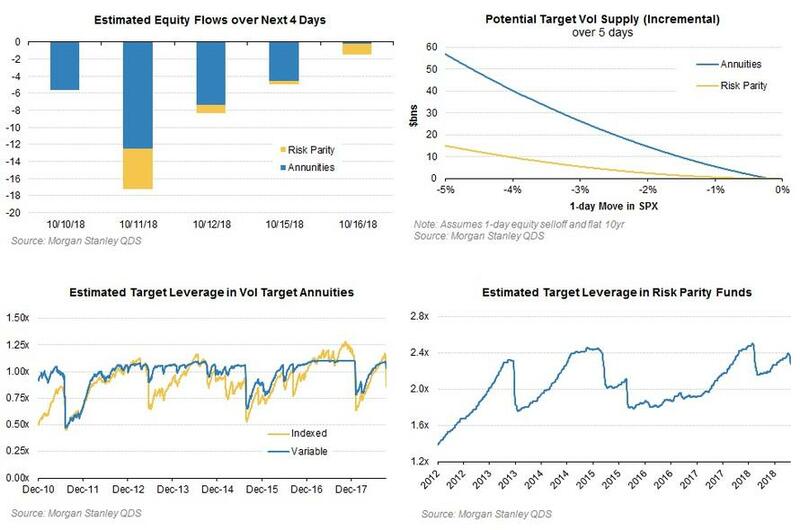 As for what Morgan Stanley thinks, calling whether there is more de-risking to come from fundamental and quant investors is a tough call, but a) a short-term bounce is possible but b) it will be followed by more weakness. That's because while the biggest single shock has likely already happened, "this de-risking could still take a few weeks to fully play out." How much has been unwound is the key swing factor. 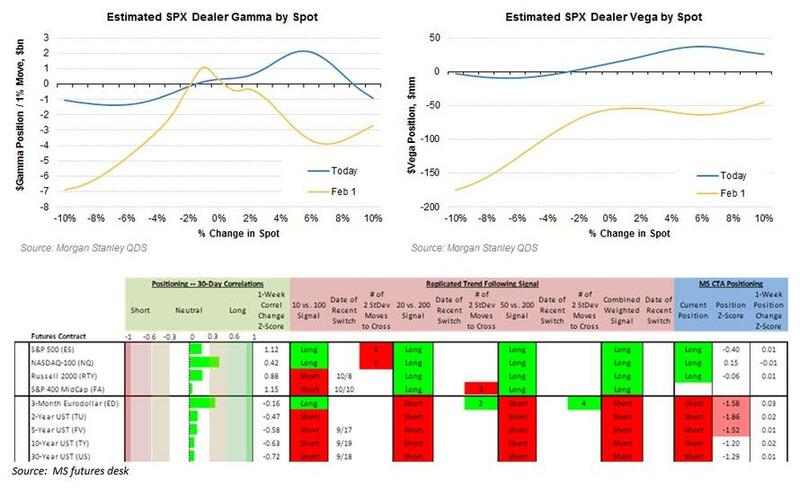 There clearly has already been heavy selling across the globe as factors and themes moved multiple standard deviations yesterday and over the last week (see previous QDS pieces for details in the US, and the attached work by Rob Cronin for an excellent analysis on European flows). But arguably there is more to come given years of positioning buildup. 2. Also different now is that global central banks are now withdrawing money from the economy, market liquidity has yet to fully rebound after February, and today is the peak of the buyback blackout window (vs ½ in blackout during the February selloff). CTAs have less to do. Yes they could have sell to $10 to $30bn of US equities, but this pales in comparison to the ~$100bn they likely sold of global stocks in February. Why? Equity leverage is likely 1/3 of what it was then and could even be short in ex-US markets, and trend followers are likely leaning short bonds here so making money here that lowers the likelihood of being stopped out. And while Morgan Stanley concedes that these numbers may be scary, they may also be priced in. In other words, while systematic supply will be an overhang on the market, but the awareness of these strategies and their impact is so much higher today than a few years ago that the market ‘knows’ how to deal with it. It’s also possible that this awareness pulled forward some of the supply into yesterday, which means less net selling going forward – the MS futures team notes that the open interest change yesterday was the biggest indicative increase in shorts going back over 6 years.